The world map fascinates me. I look at the world map on my Sitemeter stats program and see the Earth stretched out before me. That map gives me a different perspective on things. I can see how we all are connected across the world by the Internet. What caught my interest today was a band of green dots that went almost in a straight line across the map. It started in Northern California (San Leandro) and went through Sedona, Arizona. There was a break, and then Nashville appeared. The next green dot went to where I grew up (Buffalo, NY,) and moved on to New York City. Then another green dot for Maine (Buxton) and next a jump across the Atlantic Ocean to London. I find London interesting. I get page views from the City of London. My dots appear to follow lines heading to London. I also see another line of dots that appears on the Sitemeter map. It begins down around Bisbane, Autralia, and sometimes extends outward to New Zealand. These dots begin a line that travels through Gaza and France, and once again ends in London. The lines were so obvious today and thats why I was staring at them. For a week that line from London to Australia had disappeared and it was forming again. Then Pop! The little red dot that shows you were your last visitor came from suddenly moved. I didn’t know it could do that. That Sitemeter red dot jumped from Nashville to Medicine Hat, Alberta. A moment ago it moved to Hillsborough, North Carolina. This is fun. This is watching your blog pulse with Life! Who would have thought that a stats program could provide real-time entertainment. Statcounter also has a great world map they put stick pins in to show you where your visitors can from. I don’t think their comes alive the same way the Sitemeter world map does. Let me know if you have an answer to that question. Anyway, the Statcounter map has numerous ways you can view it, so it is far from being static. 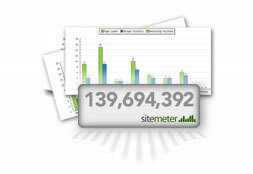 There are a number of posts here on Uduzit comparing the features of Sitemeter and Statcounter. they both offer a free stat program, and perform exactly as claimed. The numbers each of these programs provide will help make the people who visit your blog a more real experience. You will know the towns your visitors are coming from, and those towns may well be scattered all over the world. I’ll be putting up a page shortly with all the Uduzit stats posts. It has been a popular subject here. Please keep checking the right column on Uduzit for new pages. Each page comiles the posts on a particular subject. Look to the right. Oops, darn if that little red dot didn’t just jump again. I need to go see if that is you.